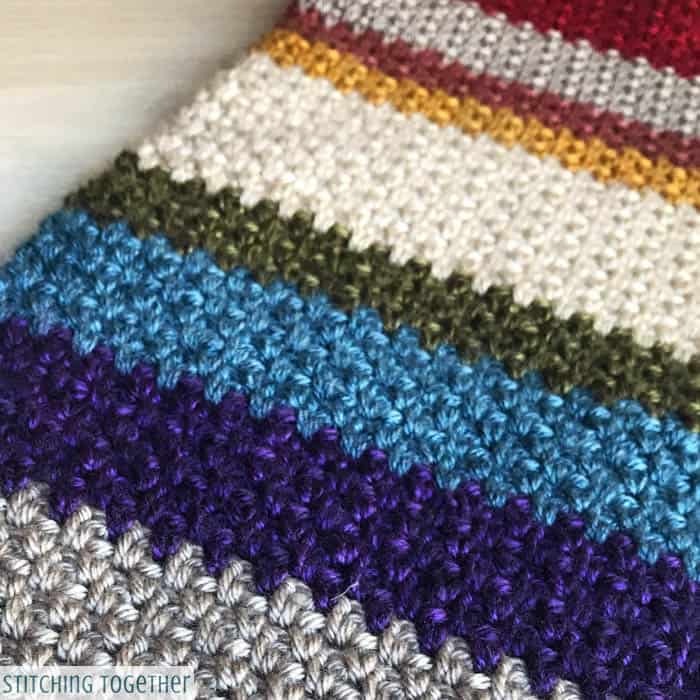 This multicolored crochet scarf is a super easy pattern using the moss stitch and is incredibly enjoyable to work up. 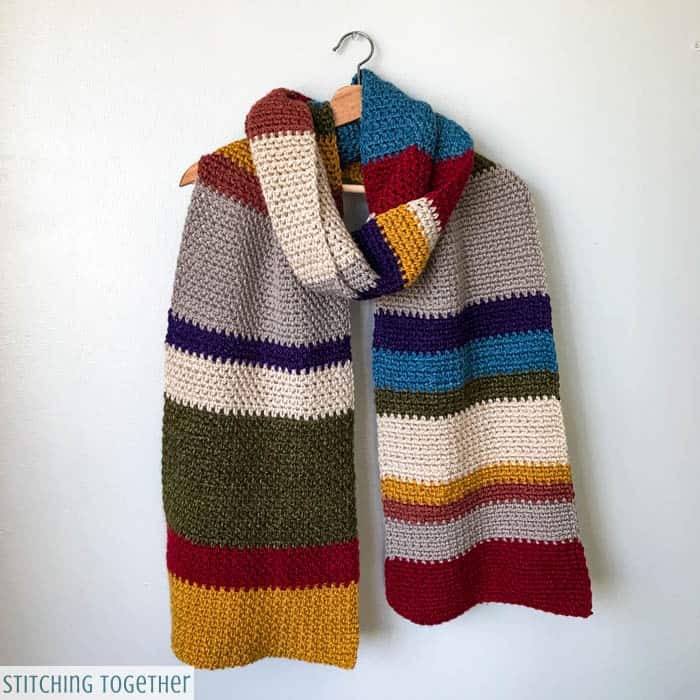 Once completed, you’ll love the fun colors, large size, and cozy warmth! 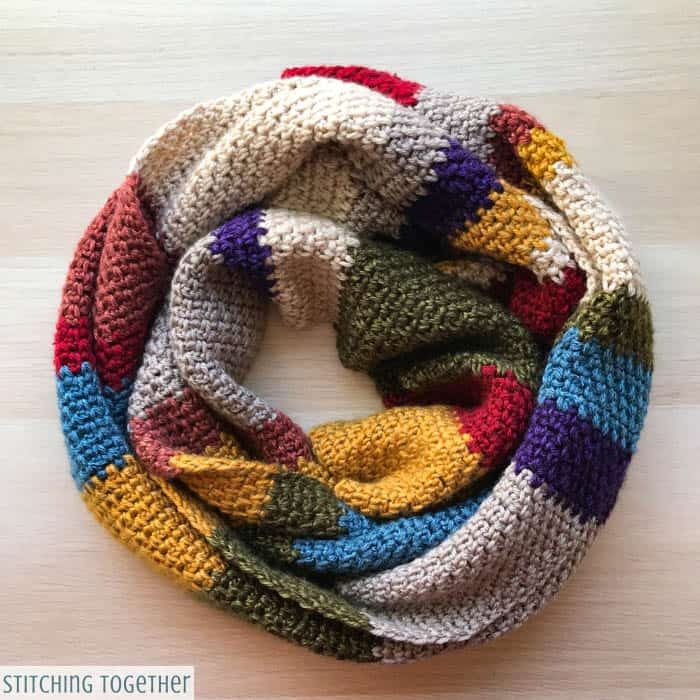 This colorful scarf was a special request from my husband last fall. Somehow I managed to surprise him with it for Christmas, even though I actually worked on it right in front of him on a couple of occasions. Too funny. 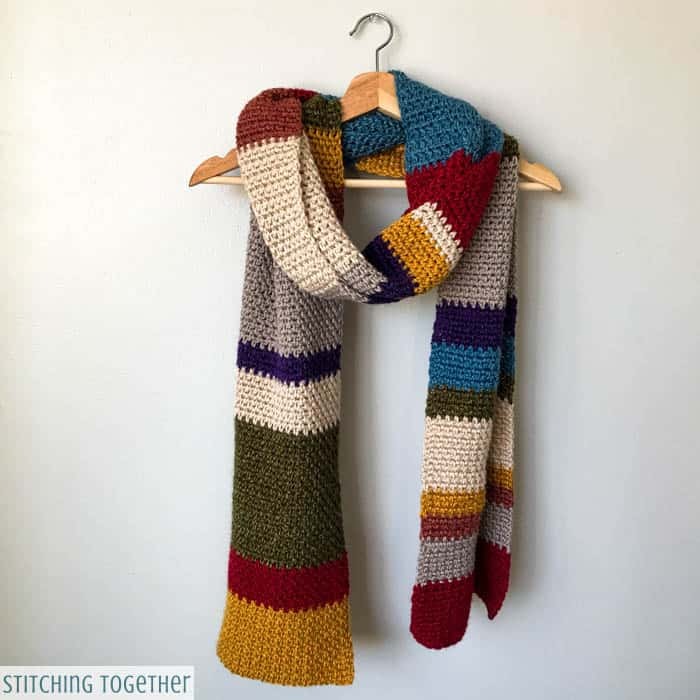 Almost all the yarn used for the scarf is heathered, which still gives bold colors, but the heathered varieties just have more depth. 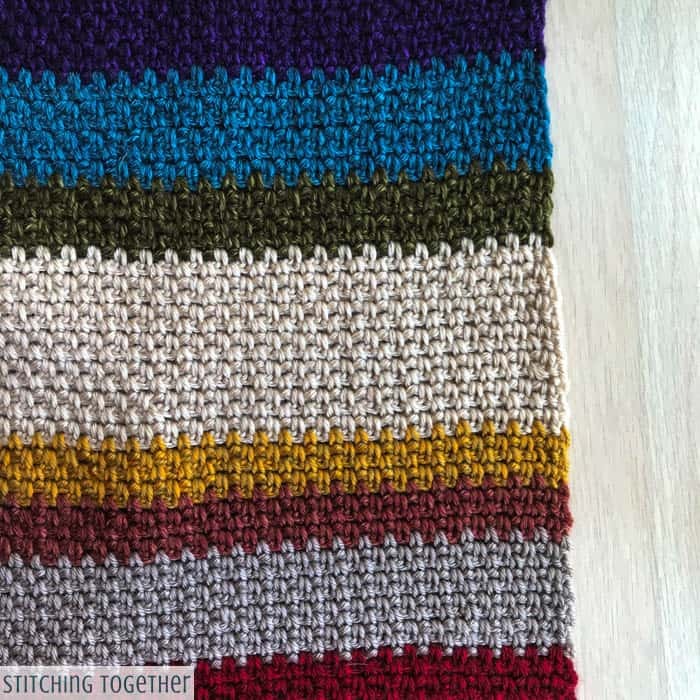 I had to use two of my favorite yarn lines, Lion Brand Heartland and Premier Yarn Everyday to get just the right heathered colors which worked perfectly. The two types of yarn are very similar and work well together. 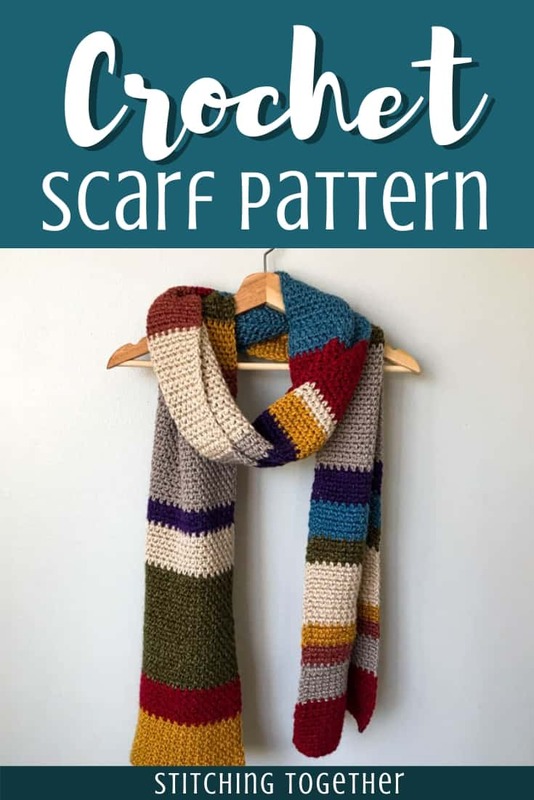 The stitches of the colorful scarf are basic crochet moss stitches, however, you’ll want to pay attention to the instructions even if you are familiar with the moss stitch. The instructions for this moss stitch are a bit different but they give a super smooth edge. Check out the moss stitch crochet tutorial for step by step photos and instructions. Repeat row 2 following the color changes in the chart below. Fasten off and weave in ends. This is another good idea for my leftover yarns. Thank you for sharing the pattern. Hi there, I can’t seem to find the Yellowstone yarn, can you tell me what I could use that would be closest to this color? Hi Tricia, Premier has a good yellow/gold color called Golden Heather that should work well.